Here is the list of Best Free Lens Distortion Correction Software for Windows. These software let you easily correct lens distortion automatically as well as manually. Various automatic and manual processes that these software utilize can be used depending upon the type of photo to be fixed. Some of these software are dedicated lens distortion correction tools, while some are Image editors that come loaded with option to fix lens distortion. The automatic processes that these software use to correct lens distortion are either based upon image content or the EXIF data of image, such as focal length of lens, lens, camera model, camera make, etc. The manual process lets you fine tune your image manually, using various sliders. Almost all of these software let you preview the changes you are making while you correct distortion. I liked almost all of these software, as they are unique in their own way, and correct distortion pretty easily. But, if I had to declare a winner, I’d nominate RadCor, as it has advanced lens distortion correction options. I’d like to give a special mention to Paint.Net’s lens distortion correction plugin, which is very simple to use and is very effective for moderate lens distortion. Go through the list to know more about the mentioned software, and you will also know how to fix lens distortion using these free software. You can also checkout the list of best free Panorama Software For Windows, Tilt Shift Software To Apply Tilt Shift Effect, and Photo Noise Reduction Software. RadCor stands for Radial Distortion Correction. It is a dedicated tool for lens distortion correction, with numerous options to correct distortions caused by various camera lenses. It offers automatic as well as manual correction options, and gives satisfactory results. The automatic lens distortion correction mode carries out EXIF based lens distortion correction. Once you load a photo with distortion, select the Profile radio button. If EXIF data of the picture is already present, RadCor will detect it, else you will have to enter the following device info: Camera make, Camera Model, Lens, and Focal length. You can also correct lens distortion in batch for a specific camera make, model, and lens. For Batch correction, you do not have to specify the focal length. For manual lens distortion correction, you have to select the Radial radio button. You can use this process to fix distortion if you are not aware of the photo EXIF, if your camera/lens profile is not available in the auto mode, or if the auto mode cannot fix lens distortion properly. There are 3 sliders available in this mode, namely: a, b, and c. Move the sliders to correct lens distortion. The value of sliders will depend on the the amount of distortion. Once you get desired result, save your photo. You can also save the slider setting, so that you can use it later on other photos. The Fish Eye radio button lets you correct fish eye lens distortion. Load your photo and select the Fish Eye radio button. As soon as you select the option, you will get a fish eye distortion free photo. You can change the fov (field of view) slider for fine tuning, or you can slide the photo along x-axis. The Chromatic option lets you correct photo colors for Red, Green, and Blue channels. The website of this software strongly recommends to change the value of “d” slider first, before changing value of a, b,or c sliders, for each color. You can select the Grid option to render a grid on your photo. This helps you with correcting distortion. RadCor is an amazing software to correct lens distortion, and can be used easily by professionals as well as beginners. ShiftN is an automatic lens distortion correction software. Its a unique and simple software, which detects lens distortion automatically and corrects your photo. Unlike RadCor, you do not even have to enter camera or lens profile for correction. Simply load your photo, and the algorithm of this software detects the distortions to fix them. In case you are not satisfied with the result this software renders, you can always go to the Adjust Correction menu. Here you can manually fine tune distortion correction parameters, such as: Shift, Rotation, Distortion, and Horizontal shortening. Once a photo gets fixed, Save and Exit the application. It automatically cuts out a rectangular photo out of the newly corrected photo. Its one good software to fix lens distortion and is capable of fixing small to high lens distortions. GML Undistorter is another free dedicated lens distortion correction tool. This software corrects lens distortion based on the focal length of the lens used to shoot photo. Simply load a photo, use image EXIF to fetch focal length of lens or manually enter it. Use the Fine Tune slider if required; the changes being made are displayed in a preview panel. Click Undistort option to apply the correction on photo. 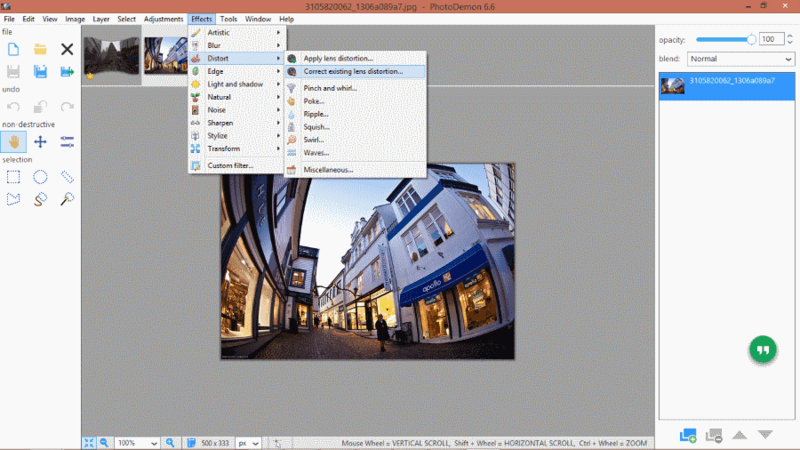 To save your photo, you can define output folder, photo quality (only JPEG), and choose to save EXIF info. There are no other options and it fixes lens distortion pretty effectively, given that proper EXIF data is provided for accurate focal length. You can use it for normal as well as high lens distortion. GIMP is a powerful and opensource image editing tool, available for Windows, Mac, and Linux. One of the tools available in GIMP lets you Correct Lens Distortion. Lens distortion correction in GIMP is pretty easy and can be carried out for images with small to medium lens distortions. It does not have predefined settings to correct lens distortion for specific cameras, lenses, or focal points. All the lens distortion correction in GIMP is to be carried out manually by adjusting various parameters. The lens distortion correction tool is available under Filters>Distorts>Lens Distortion. After you load an image with lens distortion, bring up this tool. A small window will popup, where you can make correction to lens distortion in real time with the help of Preview panel. Slide the Main and Edge sliders to adjust the distortions. The Zoom slider is to get rid of the photo parts at the edges, that may get stretched while correcting lens distortion. The X-shift and Y-shift sliders are to tilt photos vertically and horizontally, respectively. One interesting thing about this tool is that it can also be used to add lens distortion to photos. I would use GIMP to correct lens distortion if I had to correct photos with small lens distortion. 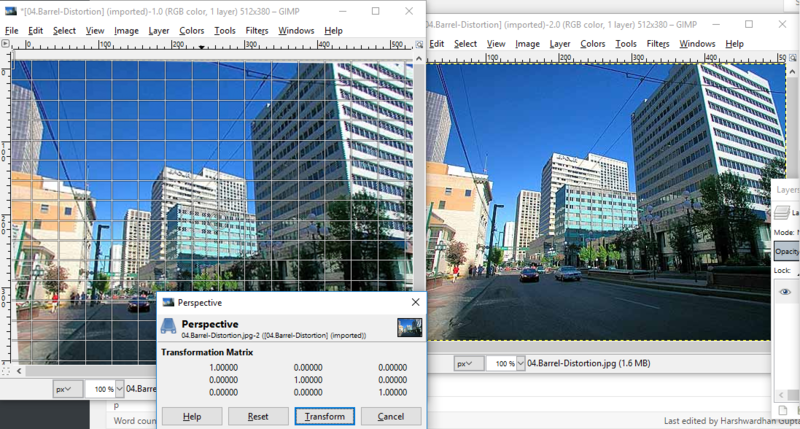 PhotoDemon is an open source photo editor with lens distortion correction tool. You can use this layer supported image editor to edit, manipulate, and beautify your photos. The tool to correct lens distortion is available along with another tool to add lens distortion. After loading a photo on PhotoDemon’s interface, go to Effects> Distort> Correct Existing Lens Distortion. This opens a new window, where you can adjust various distortion correction parameters, while watching real time changes happen as you adjust sliders. 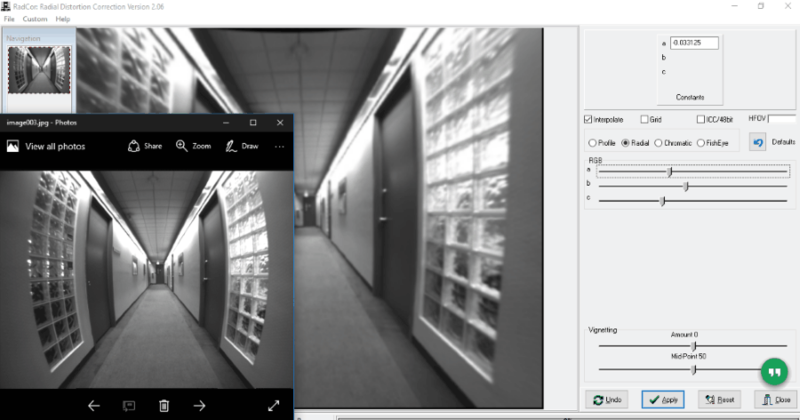 The preview panel makes it extremely easy to correct lens distortion. You can adjust: Correction Strength, Correction Zoom, Correction radius, and Quality. You can also choose what to do with the pixels that lie outside the corrected area. Once you have applied the changes made, you can save the image in desired image format or continue editing. All in all, its a complete package to edit photos. You can apply various transformation changes, add effects, add filters, and do much more. Note: The software took a while to process the lens distortion correction. Its relatively slower than other software mentioned, but the correction was at par with them. I would recommend this if you would like to edit your photo along with applying lens distortion correction. Paint.Net is a famous image editing software, which can help you out with correcting lens distortion. You can correct small and medium amount of lens distortion here; however, for you to achieve this, you will have to install a Plugin. Get the Len Distortion Correction Plugin for Paint.Net here. The downloaded file is a ZIP file; unzip it and the copy the file. To Install the plugin, go to the Paint.Net plugin folder, that is: C:/Program Files/Paint.NET/Effects/, and paste the file here. Now start Paint.Net or restart if its already open. You will find the lens distortion correction plugin at Effects> Photo > Lens Distortion. The process is as simple as moving a single slider. Load the photo with lens distortion, then open the plugin. A small floating tool will appear with a slider to adjust Amount per thousand. You can move the slider in both ways till 50 counts. Once the distortion is corrected, click OK, then save your photo. Click on the above photo to view the comparison of original and corrected photos. As I mentioned before, this plugin is apt for photos with low lens distortion, and works swiftly. Its a must have plugin for Paint.Net users. 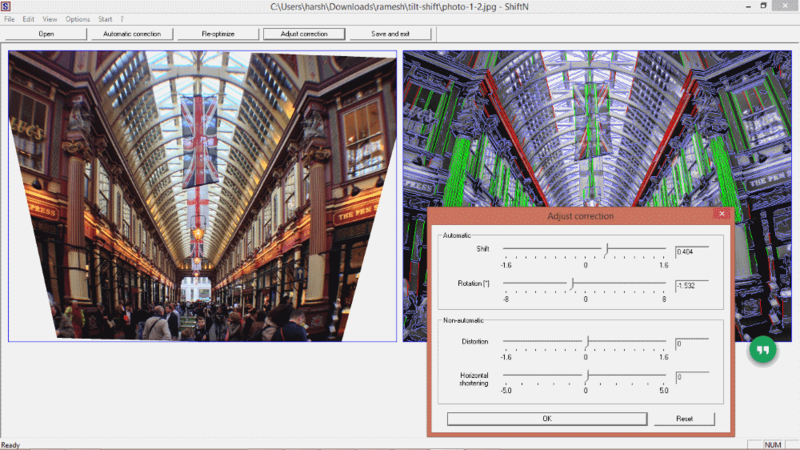 Hugin is a free panorama stitching software, which lets you carry out complex image post processing. You can also carry out lens distortion correction with this freeware. The process to carry out distortion correction is a bit complex. It might be easy for people who are familiar with this software, but can be tedious for newbies. Lens distortion correction in Hugin is commonly referred to as Lens Calibration. It uses photo EXIF as well as reference lines (which you have to add manually) to fix distortion. A tutorial for the same is available on Hugin’s website: Hugin tutorial — Simple lens calibration. Go through the tutorial to try out your luck with Hugin. I tried to fix lens distortion on Hugin, but the method was too complex for me to get a final result.